All AWA products are the “fine screen mesh” technology that is rated #1 by Consumer Reports. Their Micro Mesh Systems are the best in the industry because they are made from the best materials with the best design. 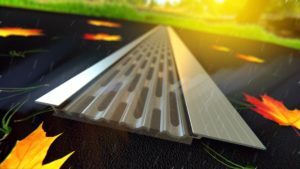 The extruded aluminum frame offers strength and durability in harsh conditions that gutter guards made with plastic cannot provide. In addition to the inherent strength of the aluminum, the frame has been anodized which hardens the aluminum and makes it compatible for use with copper and steel gutters. The Micro Screen Mesh is available in either 50 or 30 micron Surgical Grade 316L Stainless Steel. Holes so tiny that, not matter how small the debris, only water can pass through keeping your gutters clean and clog free. The Fine Mesh and Durable Frames are sealed with a High Grade Rubberized Adhesive that never gets hard or brittle. It’s designed to stay pliable which holds the Mesh in place regardless of the ambient temperature. Anodized Aluminum – Protects against dissimilar metals. This process allows our product to be installed on copper or steel gutters. Surgical Grade 316L Stainless Steel 50 Micron Mesh – No organic material will grow or adhere to the ArmourGuard Screen. No holes or openings – only water enters your gutters. Moderate to Heavy Debris conditions – No leaves, pine needles, shingle grit or dirt will get into your gutters! Completely Sealed System Gutter System – No insects or pests will enter your gutters! Installs at the same pitch as your roof – sheds all debris quickly and easily. Highest Rated Gutter Guard Technology by Consumer Reports Magazine. Works on All Roof and Gutter Systems.